Animal Planet turns its cameras onto Brisbane once again for Season 2 of Snake Boss. Snake catcher Julia Baker is one of just a handful of females in Australia relocating snakes for a living. From uncovering deadly Eastern Brown snakes inside children’s bedrooms to removing them off rooftops, Snake Boss follows Julia as she continues to rescue residents from these unwanted slithering visitors with some help from her husband and fellow snake catcher, Johny Gallacher and their dog, Bonnie. Retrieving and relocating snakes is all in a day’s work for the tenacious snake catcher, although unluckily for Julia, plenty of calls out this season will see her facing two of her two biggest phobias – heights and spiders – which threaten to get in the way of her doing her job. 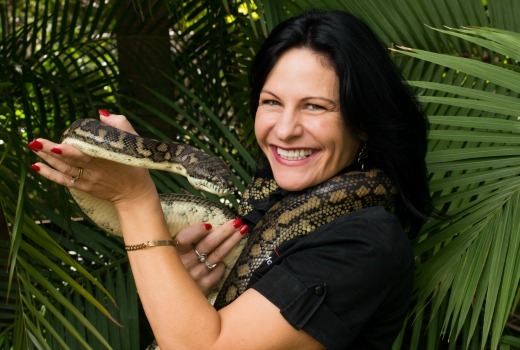 Our Snake Boss will also tick off some truly big boxes on her bucket list, including: catching a large Eastern Brown, coming face to face with the notorious Coastal Taipan, and a trip to a leech-infested rainforest to observe snakes in their natural habitat. With lots of surprises around every twist and turn, you’ll be holding on tighter than a strangling python! Monday 24 October at 9.30pm on Animal Planet.